"I'm just a red-blooded boy and I can't stop thinkin' 'bout girls." 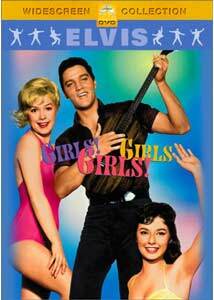 The great thing about Elvis movies is that, even though they're generally pretty bad, they're bad in the same fun way. Girls! Girls! Girls! isn't of course going to take its rightful place beside Grand Illusion in the cinematic pantheon, but you know what? This is a whole lot more fun. It's a throwaway bit of entertainment, with the King at his most charismatic. Presley plays Ross Carpenter, a Hawaiian tuna fisherman—orphaned, he was forced to sell the boat that he and his father built to kindly Papa and Mama Stavros. The bad news now is that, for health reasons, Papa and Mama have to move to Arizona, and their fleet is up for sale; poor Ross doesn't have the cash to pony up to buy back his dad's boat. But: he can sing! He meets perky little Laurel (Laurel Goodwin), a cute new face in town; Ross takes to her, but Robin (Stella Stevens), the entertainer at the town nightclub, doesn't, nor does she care for Ross lavishing so much attention on her. Robin fancies herself Ross's girl, but Ross seems to have other ideas. There isn't a whole lot to this, dramatically—it's not much of a love triangle, nor an especially suspenseful drama. (It's the oleaginous Wesley Johnson, played by Jeremy Slate, from whom Ross has to extricate the S.S. Kingfisher.) Even worse are the caricatures presented of Ross's Asian surrogate family—Elvis actually says about them: "You know how the Chinese are. Inscrutable." They even refer to their eldest boy, in true stereotypical Charlie Chan fashion, as "number one son." But the good news is: there's a soundtrack. There's only one memorable song, really: Elvis' nightclub rendition of Return to Sender. Stella Stevens actually does a pretty nice cover of The Nearness of You, but of course the funniest stuff is saved for stuff like the singing fishermen. (It's hard to take it all too seriously, because Elvis clearly doesn't.) Nothing takes the sting out of a poor day's fishing like having the boat captain sing a calypso song while strumming on his guitar, and Presley seems to be having stupid, giddy fun when he sings about pulling into the marina with a boat full of tuna: "We're headin' for home / The fishing was great / We're comin' in loaded / 'Cause we're all out of bait." It ain't Sondheim, but in some respect, it's even better, because it's Elvis. Image Transfer Review: The colors are nicely saturated, but there are a good deal of scratches and bits of debris on the print. Also, the lighting levels tend to be a little off, especially for the scenes at sea�it seems as if some of the footage was stock, some was actually shot on the water, and some on a soundstage, and that no care was taken to see that the times of day match up. So it looks as if the sun is up, then sets, then a few seconds later pops back up again. Movie magic! Audio Transfer Review: Is there really a core audience out there who wants to hear this in an overmixed 5.1 track, instead of glorious mono? (I bet you can't guess where my preference lies.) Both are perfectly adequate; Le Roi is dubbed into French only for his dialogue scenes, and not for the songs. Extras Review: Chapter stops and subtitles are the only extras. Some goofy stupid fun for Elvis devotees, though you may come away wishing that Presley and the Colonel were at least marginally more rigorous in their choice of material.